Were Fleet Marriages Taken as Legal? Home > Marriage Records > Were Fleet Marriages Taken as Legal? Fleet marriages form a curious little anomaly in the history of marriage in England. They only happened in a few specific areas and then only really from 1696 until the Marriage Act of 1753, which necessitated the reading of banns for a marriage, with the need for the ceremony to take place within the precincts of a church. Fleet marriages were quick and legal, without any of the rigmarole associated with the church. There was no need to wait several weeks while the banns went up; everything could be done in a matter of minutes. The Fleet was in London. Although Newgate was the city’s best-known prison, the Fleet was famed as a debtors’ prison, a place that saw both rich and poor inside its walls. By some curious quirk, when the Marriage Duty Act of 1696 passed, introducing banns before marriage, the Liberty of the Fleet (this is, the prison and the area surrounding it) was somehow exempt, as was the Liberty of the Mint, which contained the King’s Bench Prison. This made them a destination for anyone who wanted to marry quickly and cheaply, although it’s the fame of the Fleet that’s lived on. There was also May Fair Chapel, which saw marriages performed from 1720-1753. These marriages, many of them conducted in inns and taverns, were perfectly legal, performed by Fleet clergy, and were recorded. The ease and convenience actually took marriages away from other places. 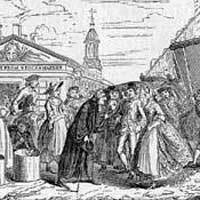 By the 1740s, for instance, half of the marriages recorded in London took place in the Fleet, and of the 47,000 a year in England, some 6,000 were in the Fleet. It was a huge industry. Statistics show that the Fleet wasn’t just a haven for young marriages. Couples, on average, were in their twenties. But it was cheaper than church marriage, and for many this would have been an important factor. For those in the army or navy, home briefly and with no time for the banns, a Fleet marriage offered an alternative. Similarly for those who might have recently arrived in London, be it from the provinces or abroad; as long as they had the fee there were no questions asked and no parental permission needed. That’s not to say all the marriages were above board. There were recorded cases of bigamy in the Fleet, with some going to wed several times before being caught. There were also instances of forced marriage in the Fleet too, as not all those conducting ceremonies hewed to the laws. Couples could enter most establishments that performed marriages within the Liberty of the Fleet and walk out in a quarter of an hour as man and wife. If they paid a little extra they could even have a marriage certificate. If they chose they could stay on at an inn to celebrate the event. Although Fleet marriages were generally considered to be clandestine, they were perfectly within the law as it stood until 1753 (actually coming into effect in 1754). Marriages took place within Fleet prison itself, or at the inns or specialist marriage houses within the liberty (denoted by a sign showing clasped hands). Trades grew up around Fleet marriages, and some clerks earned their living simply by recording them. As stated, there were records of Fleet and Mint marriages, and these have been kept, so it’s possible to research them to discover if one of your ancestors underwent a marriage there. These are kept at the National Archives, a mix of note books and registers than run from 1677 all the way to 1777, long after the 1756 Marriage Act. The problem with the records is that people were free to give any name they liked – there was no way of checking. In the early records (pre 1714), the dates were often off, and anyone investigating the records should remember that the country was still using the Julian calendar for most of the period.